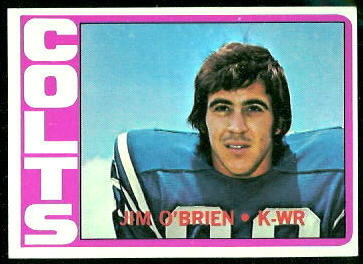 1972 Topps football card of former pro football placekicker Jim O’Brien, who had a short and mostly uneventful 4 year career in the NFL with the Baltimore Colts and Detroit Lions. Playing in the tail end of an era where kickers also played other positions (the early 1970s), he was also a wide receiver. O’Brien made only 60 of 108 field goal attempts in his career, but in his rookie season of 1970, he booted a 32 yarder with 5 seconds left in Super Bowl V to give the Colts a championship victory over the Dallas Cowboys.